The “Fourth Industrial Revolution” that Klaus Schwab refers to is not based on politics, financial markets, regulation or even globalisation. The Revolution is based on one thing — technology. So far we have seen technologies like computer chips, sensors, broadband, mobile devices, apps and social networks transform the way we live and work. But this is just the beginning. Our world is about to be completely rocked — in a way that Bitcoin is just starting to rock people in finance — by a whole series of transformative technologies that are growing at an exponential pace. What are these technologies? Blockchain, Artificial Intelligence (AI), Augmented / Virtual Reality, 3D Printing, Robotics, IoT, Nanotechnology, Quantum Computing, Autonomous Vehicles, Electric Vehicles, Drones, Synthetic Biology, Solar Power, Battery Power, 5G. And more. The incredibly rapid pace of disruptive change and value creation from technology is already upon us; it is starting to build speed and mass, like a tidal wave. Ten years ago, only one technology company — Microsoft (worth $270b at the time) — was among the ten largest companies in the world by market cap. 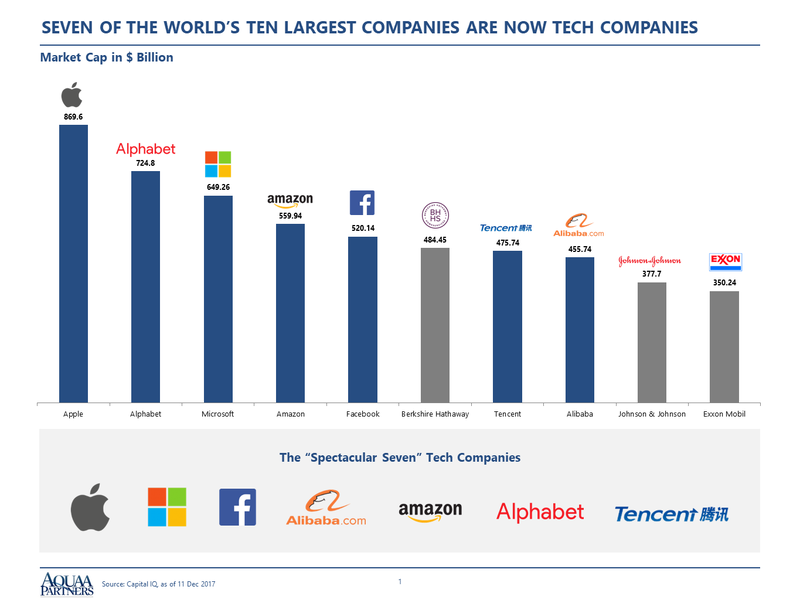 In contrast, today 70% of the world’s ten largest companies by market cap (the “Top 10”) are technology companies. The market value of tech company representation within the Top 10 over these last ten years has increased by 1,442%, from $276 billion to $4.3 trillion. Meanwhile, the market value of non-tech companies in the Top 10 has declined by 56% from $2.8 trillion to a $1.2 trillion. This value creation is not a bubble. And it’s not just the largest companies that represent this shift in power. 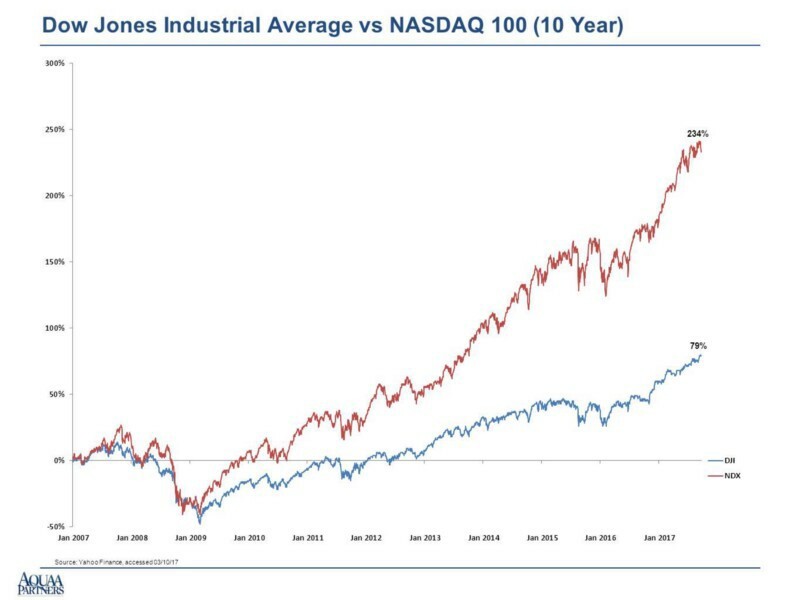 Taking a broader view, in the last five years the tech company-heavy NASDAQ 100 (“NDX”) generated a return of 153% versus the established-company heavy Dow Jones Industrial Average (“Dow”) return of 80%. 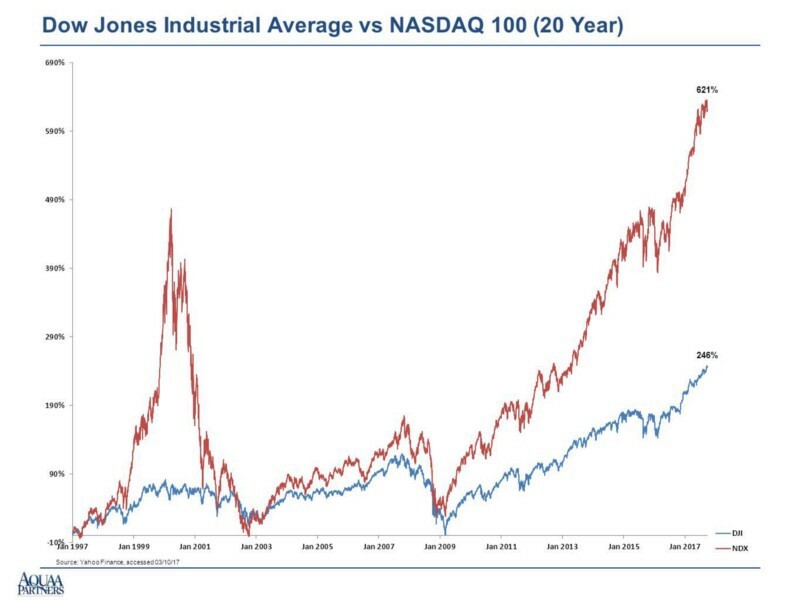 Over the last ten years, the Dow has risen only 79%, while the tech-heavy NDX has risen by 234%. Taking a longer term perspective, the gap increases to a 621% return for the NDX versus only a 246% return for the Dow over the past 20 years. Only Berkshire Hathaway, Johnson & Johnson and Exxon Mobil remain in the global Top 10 as “non-tech” companies. But soon they will be tech companies too, whether they know it or not. They don’t have a choice. The force is just too powerful — it’s like gravity. Berkshire Hathaway’s businesses, a chunk of which are insurance related, are under disruptive threat from all sides. J&J’s products will come under increasing threat from start-ups in nanotechnology, synthetic biology and other technological areas and Exxon Mobil is facing total disruption if not extinction in the next 10 years from the threat of solar energy and electric vehicles, among other things. 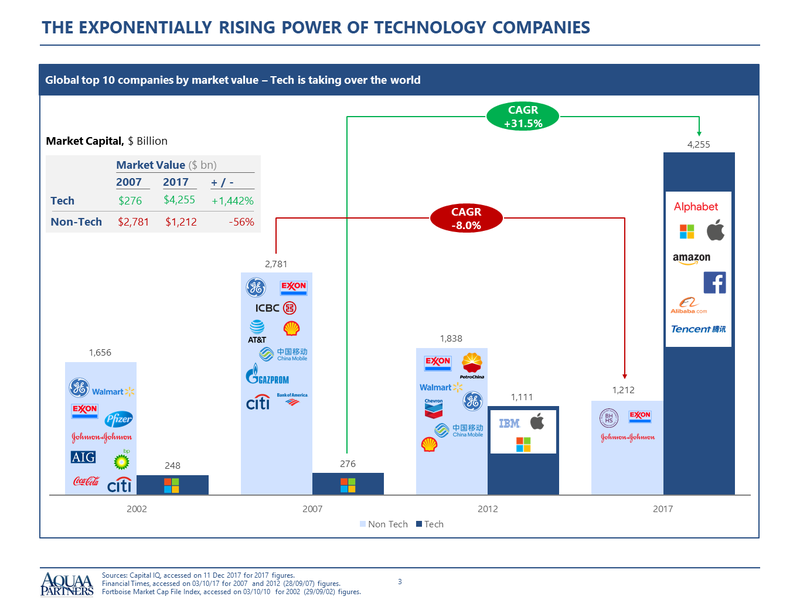 In fact, pick any non-tech company in the Fortune Global 500, with the exception of a few proactive forward-looking companies such as Walmart, GM and BBVA, and I can make a case for their potential demise via technology disruption and market value destruction in the next 5 to 10 years. Look at bankrupt Toys R Us. It was the dominant niche retail leader of a huge industry — toys. What happened? Was the Toys R Us filing for bankruptcy protection in September 2017 a result of its $5b debt and $400m annual interest payments? Yes and no. Yes Toys R Us had a crippling level of debt, but it could have grown out of it. Not only did the company not innovate, but it did not acquire tech companies like its bricks-and-mortar retail peers, Walmart (Jet.com) and PetSmart (Chewy.com) did. It did not convert its stores into American Girl Doll experiences. It did not create a “National Lego Championships” or equivalent. It did not create Pokemon experiences, or slime craze contests. You could buy the same toys from Walmart anyway while you pick up your groceries, or through a YouTube channel link or on Instagram. The list goes on. With Toys R Us, as with so many other companies, you evolve or you die. If you are an established, “non-tech” company you should be afraid. Very afraid. Start-up tech disruptors are well-funded, rich with talent and multiplying. They are everywhere and they are coming to get you. They’re hungry, they’re impatient, and they are driven to win. They want your customers. They will do almost anything to get them. The fact that tech will win is almost a forgone conclusion. Already mobile devices are everywhere, with apps for everything, and soon every “thing” will be connected. Including your own brains (yes, VCs are pouring capital into the original AI device — the human brain. Since 2016, VCs have invested more than $600m into companies working on devices and therapies using some form of brain-computer interface, neurostimulation or implantable devices). Soon is not 20 years. It is 5 to 10 years. We have to keep reminding ourselves — these technologies are not growing linearly; they are growing exponentially. Change — change in what your customers are buying, and change in how they are buying what they buy — is going to happen faster than you think. Consider this — a Chinese search engine company, Baidu, has recently announced it is investing $1.1 billion in a self-driving car fund. It says it will invest in 100 autonomous driving projects in the next 3 years, as it wants completely autonomous cars on China’s roads by 2020. Sales at large traditional companies are declining. Campbell Soup, an iconic $15 billion market cap company, posted its 11th consecutive drop in quarterly sales. Sales at General Mills, the estimable consumer foods company with a $32 billion market cap, have dropped by approximately 11% since 2015. Sales at Conagra Brands, a $15 billion market cap packaged foods company, have plunged 14% from $9.1 billion in 2013 to $7.8 billion in fiscal 2017. Traditional activist tactics such as cost cutting, factory closures, and asset sales are not enough. 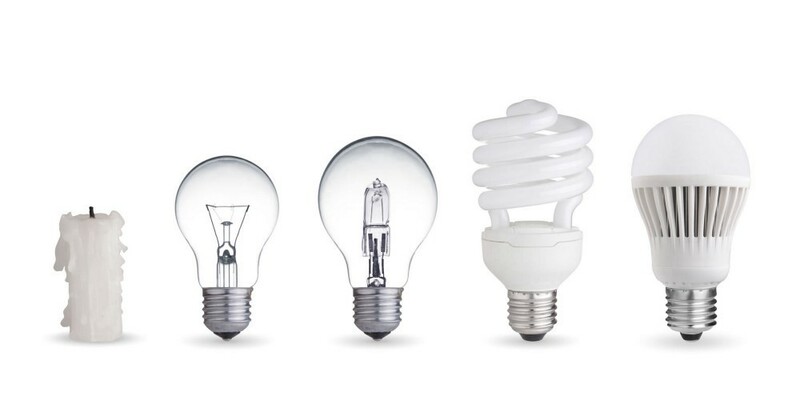 These companies must leverage technology — and technology companies — so that they can transcend obsolescence and thrive well into the next era. They must not only find new ways to grow, but to create lasting market value. Today true market value creation can only be achieved, on a sustainable basis, by leveraging technology companies. 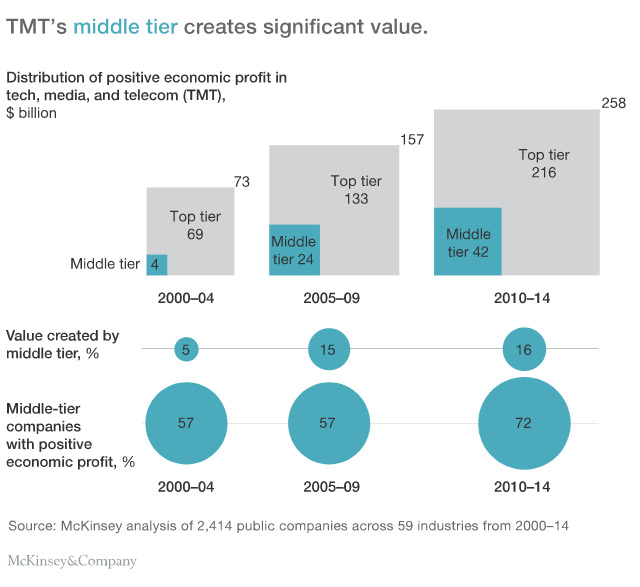 Indeed, according to this McKinsey research, of more than 2,400 publicly traded companies around the world, the economic profit generated by TMT (Technology, Media, Telecoms) companies grew 100-fold, or by $200 billion from 2000 to 2014. Some 70% of the companies in the sample generated economic profit during 2010–2014, up from 45% during 2000–2004 (see chart). 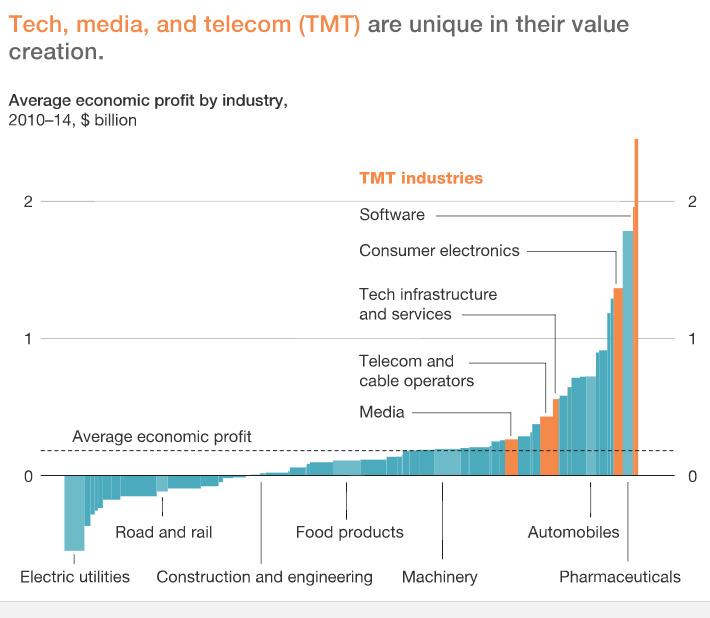 Significantly, each of the five subsectors that make up TMT was among the most profitable of the 59 industries analysed. As I stated at the beginning of this article, it’s not just the large companies that are benefiting. They are also nurturing a group of middle tier companies (in the 20th to 80th percentiles in terms of economic profit) that is leading the sector in profit growth. Their economic profit grew by a factor of ten between the 2000–2004 period and the 2010–2014 period, or more than 3x the growth rate of the large technology giants. Even as industry barriers are breaking down from technological advances and new competition that emerges as a result, CEOs and corporate executives running established non-tech companies in traditional industries continue to tell me they “have no interest in acquiring a technology company” or “it is not in our strategic plan to acquire a technology company.” To them I ask “why not?” If investing is about the future, then what is the future about if not technology? If you are not already a technology company then it is highly unlikely that you are going to grow technology leadership purely through organic efforts. Things are moving too fast now. The only way to get and grow technology leadership is to acquire it. To win, as Wayne Gretzky famously said, one has to skate to where the puck is going, not where it has been. Technology companies have the power in industry now. This power is not a fad or a trend or a bubble. It can’t be “managed” by regulatory authorities. We’re in the end game to the Singularity. Acquiring technology companies is how established companies will need to play the game. In the end, the leading established companies will become technology companies. Acquiring a tech company is risky, and can look “expensive”. It can be scary. Of course it could go wrong. Most people thought Mark Zuckerberg of Facebook had lost the plot in 2012 when he agreed to acquire a company with 13 employees and zero revenue — Instagram — for $1 billion. But Instagram today is probably responsible for at least $100 billion of Facebook’s $500 billion market value. Walmart faced scrutiny when it announced the acquisition of the fast-growing tech company, Jet.com, in August 2016 for $3.3bn. The conservative Fortune 100 company, Walmart, paid a 13x revenue multiple for Jet.Com, when Walmart’s own revenue multiple was only 0.57x. In the 16 months since announcing the Jet.com acquisition, Walmart has created approximately $60bn of market value, almost all of it driven by Jet.com. Humans can’t fight the law of gravity. If Walmart, GM and BBVA can successfully acquire tech companies then so can you. Plant that tree. Become a technology company before a technology company becomes you.